The Rangitata River and its tributaries provide excellent fishing for salmon and trout. 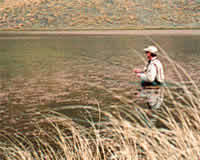 Fish in your own time during your stay at Mesopotamia or let us organise your guided fishing day. For a unique ‘Mesopotamia’ day fly out to one of our remote tarns on the Station with a picnic hamper and fish in splendid isolation. 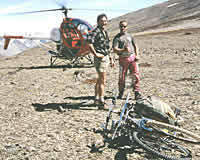 Bring your own horses and ride round the hills or up the braided Rangitata River. More adventurous riders may want to stop over in one of our mustering huts, cooking with the camp ovens and bathing in the outdoor fire-warmed baths! The station has its own Hughes 500C and MD Notar helicopters perfect for the birds’ eye view of the breath-taking scenery. Get aerial views of where they filmed the Edoras scenes from the Lord of the Rings or get dropped off up in the valley and hike home. Plan a multi-day trip into some of New Zealand’s most spectacular and remote country and stay in one of our back-country mustering huts. Ride up the wide Rangitata river valley to the back-country huts in a day or plan an adventure into the heart of the South Island. Enjoy a day trip with the famous Rangitata rafts. Contact us for bookings. Visit historic sites of Samuel Butler and Dr Sinclair – more history information. Other activities to do include: kayaking, winter heli-skiing and boarding – speak to us about heli-skiing and heli-boarding high up in the Two Thumb range. Contact us and we will help plan your holiday with as much or as little of our input as you like. Anything is possible.